Advance Tabco PRGS-24-24 Prestige Series Stainless Steel Recessed Bar Drainboard - 24" x 30"
Keep clean glassware always within reach with the Advance Tabco PRGS-24-24 Prestige series stainless steel recessed bar drainboard. Items found within the Prestige series of underbar equipment line up perfectly with each other, creating a uniform look across any bar. In addition to a number of eye-catching features, this item boasts an exclusive twist-action leg assembly for added strength and an extended 7" backsplash with a rear deck to create a truly one-of-a-kind unit. 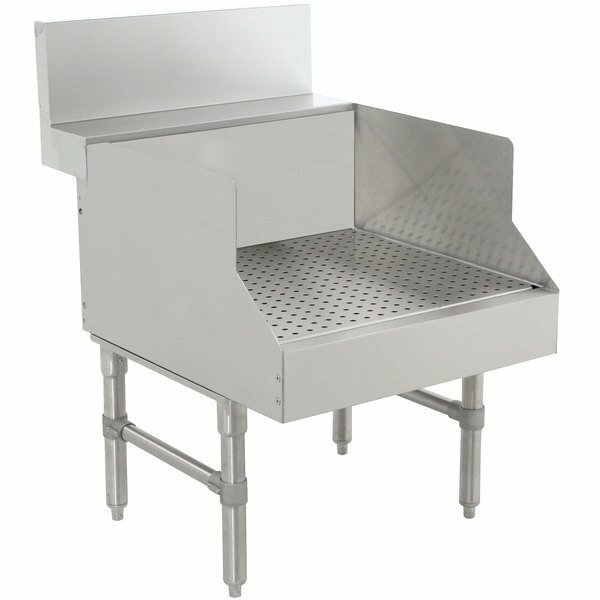 The perforated drainboard is removable for easy cleaning and sanitation. Plus, the whole unit is sound deadened so that you can use it even during peak business hours without worrying about extra noise. The unit also features a 1" IPS drain and is fitted with 14" side splashes and an extended 7" backsplash to quickly drain away excess water while protecting the surrounding area from drips and splashes. Its recessed design means that this unit can hold multiple tiers of glassware in a secure manner so that you always have the glasses you need close at hand. This drainboard is designed for exceptional durability and years of high volume use thanks to sturdy stainless steel construction. It is supported by 1 5/8" O.D. 18 gauge stainless steel legs with twist-action assembly for added strength. Plus, the adjustable stainless steel bullet feet ensure that this drainboard can adapt to any unevenness in the floor.